The EFS C pulse jet cleaning, free standing cartridge unit has been designed for use in a dust control applications where a compact, high efficient dust control unit that is required to operate continuously over long periods of time is required. The EFS C pulse jet unit utilises automatic constant pneumatic cleaning of the cartridges which allows the unit to be operational for long lengths of time without the need to stop the system for clean down of the filter media. The cartridges used by EFS are of a single open ended type therefore there is only one seal required on the open ended dust end. Due to the high levels of filtration that can be achieved by the use of cartridges this allows for a more compact unit design that requires less floor space, but can still achieve high filtration levels .Cleaning of the cartridge elements is carried out by means of compressed air injection from the clean air side, this reverses the normal flow of air through the cartridge element, with the passage of air dislodging the dust held on the cartridge which drops into the collection bin. Cleaning of the elements takes place on a continuous basis with a run-on-timer fitted as standard. The EFS C standard units are built in three different configurations 2, 3 and 4 high with a maximum total of 24 cartridges being employed in the 4 high configurations, the range of EFS C come in two basic designs either with an integral fan set or without. Quick release bins are provided at the hopper section, however alternative hopper designs can be accommodated if required eg: hoppers with bagging off facilities or single waste discharge outlet hopper with rotary valve. The EFS V Range of filter units consist of a number of tubular filter elements mounted on wire mesh support cages, they are held vertical in the filter section of the unit, the dust ‘cake’ is then cleaned from the filter elements by compressed air which is injected into the centre of the filter tubes on the clean air side causing a shock wave effect which dislodges the built-up dust and allows it to fall freely into the collection hopper below. The EFS V ranges of filter units have been designed for heavy dust loadings or where the application demands continuous use over extended periods. 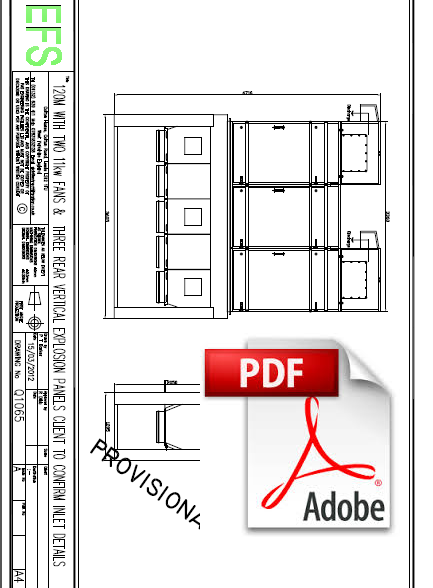 Should you require further details of this type of unit please contact one of our sales engineers to arrange a site visit. 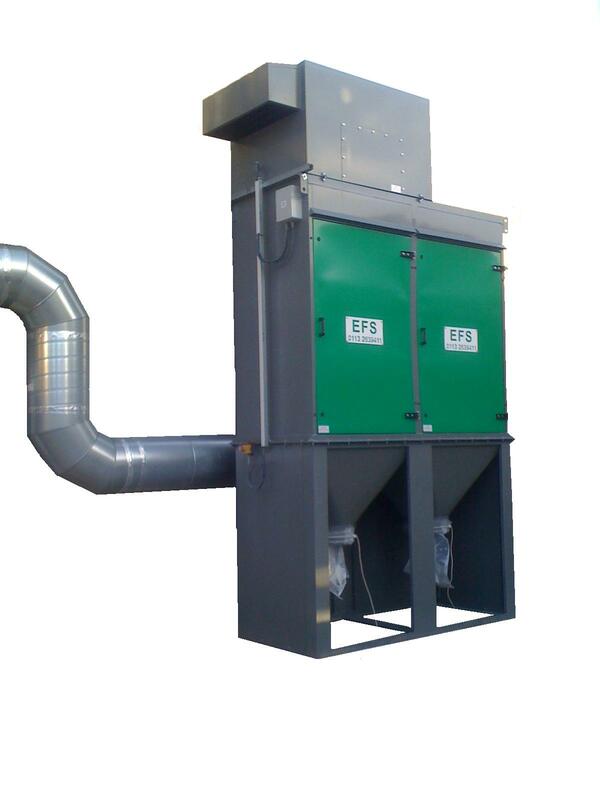 The EFS M Dust collection range of purpose built, high efficiency, specifically designed machines, manufactured in modular form to enable the correct size filter unit to be chosen for each individual dust collection requirement. Each unit includes the Fully Automatic Module which is fully self-contained and comes complete with fan unit, filter elements, automatic filter shaking, hopper section complete with quick release dust collection bin. 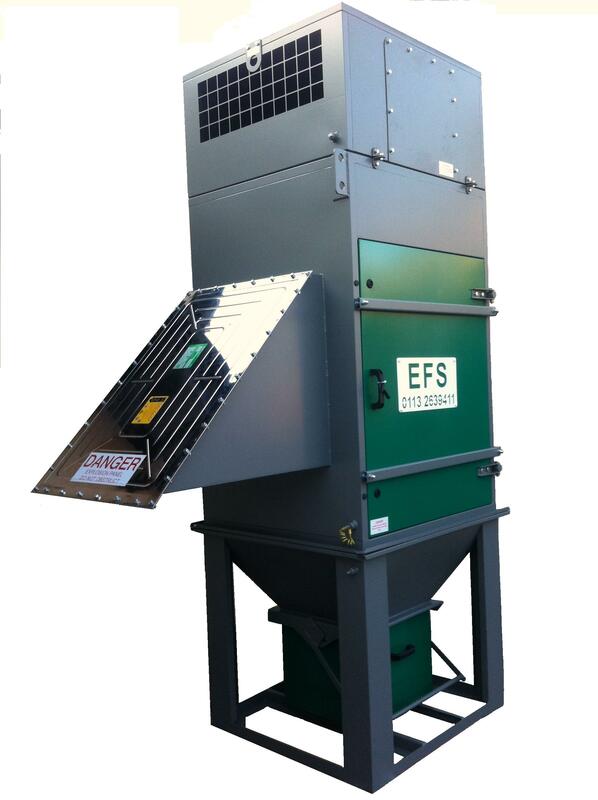 The EFS M Dust collection range are manufactured with split bolt together flanges between the filter and hopper section which allow for the fitting of a standard filter body onto different hopper sections dependent on dust disposal requirements, Standard, High capacity and bagging off hopper sections are all available together with hoppers that can be fitted with rotary valve or butterfly valves to enable ease of dust collection into plastic bags. Each of the modules can be supplied with a wide range of varied specification including the type of filter media, the fitting of special flameproof motors, explosion relief, air silencers, secondary Hepa filtration and weatherproofing for outside applications together with a selection of motor voltages to suit all requirements. 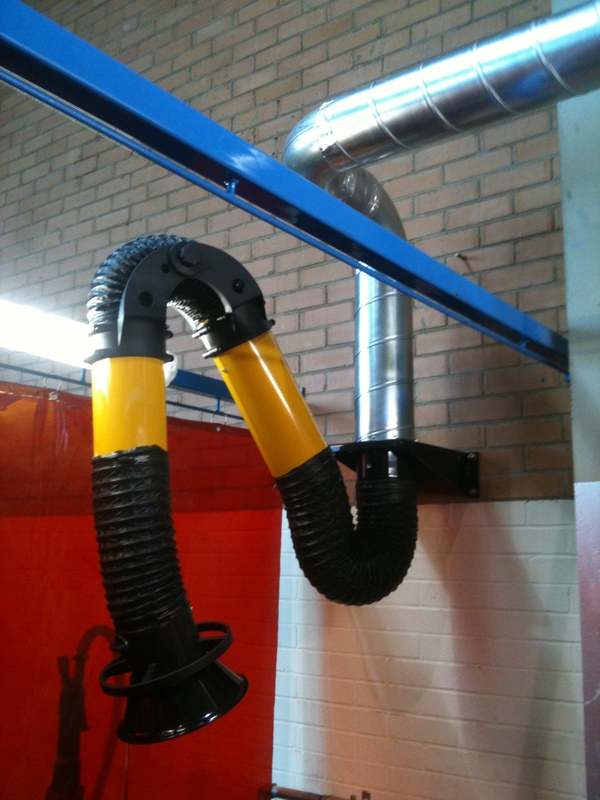 All Components manufactured by EFS as part of the dust collection device are powder coated in our Standard colours or can be powder coated in a colour chosen by the end client to suit their own requirements. 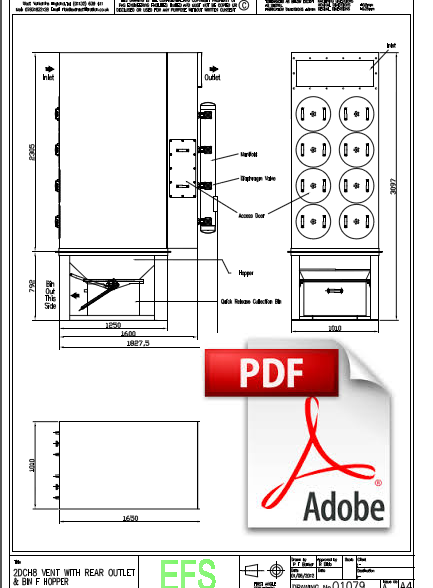 All Units are supplied with a fully automatic starter panel that is supplied unfitted for remote mounting. All internal wiring from each motor are fed to a single side mounted terminal box fitted to the side of the unit to enable wiring direct to the starter by a qualified and competent electrician. The EFS F Range are a fully self-contained range of ‘Pulse jet’ filter units supplied complete with a hopper section if required. The filter body section is flanged which allows for mounting the EFS F type unit in different orientations. These units can be fitted with integrated fan sets to enable them to be utilized in small localized applications. Without a fan set, these units can be used as a vent type unit, which can be fitted on silos or vessels that require venting whilst being filled. There are no moving parts within the EFS F venting unit which minimised maintenance requirements. 99.9% Should you require further details of this type of unit please contact one of our sales engineers to arrange a site visit. 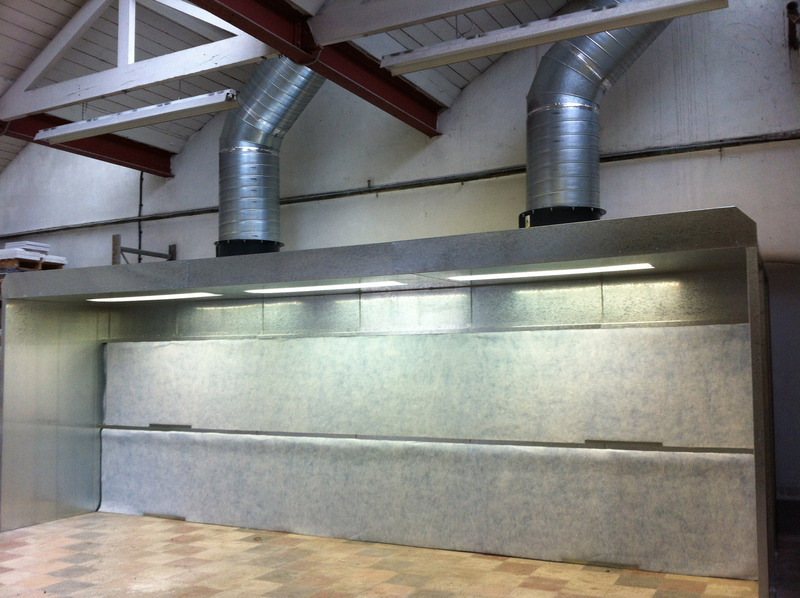 EFS Ltd offers every client a full service, from design to manufacture, installation to commission and finally a full after sales service where our specialist engineers take care of all new and existing dust extraction equipment on site. Our engineers ensure the end user comply with COSHH legislation by combining service visits with LOCAL EXHAUST VENTILATION (LEV) testing and certification. All our service engineers are trained to comply with HSG158 of the health and safety regulations and with their expert advice and recommendations can usually spot any faults before they become a costly problem. Without periodic inspection and adjustment of components by experienced personnel, plant and equipment will soon deteriorate and become inefficient, creating potential problems and increased repair costs in the long term. EFS Ltd offers a complete site service agreement which not only includes new plant, but existing plant supplied by other manufactures where we can record all details and create a service log. Spares part for EFS units and units supplied by other manufactures. EFS can supply all spare parts for both our own Dust Extraction equipment and Dust equipment supplied by other Manufactures ie. EFS can supply filter elements for numerous applications in different clothes and finishes. Filter plant accessories EFS can supply numerous accessories and components that can be utilized in a complete turnkey project or used to upgrade and improve existing systems. 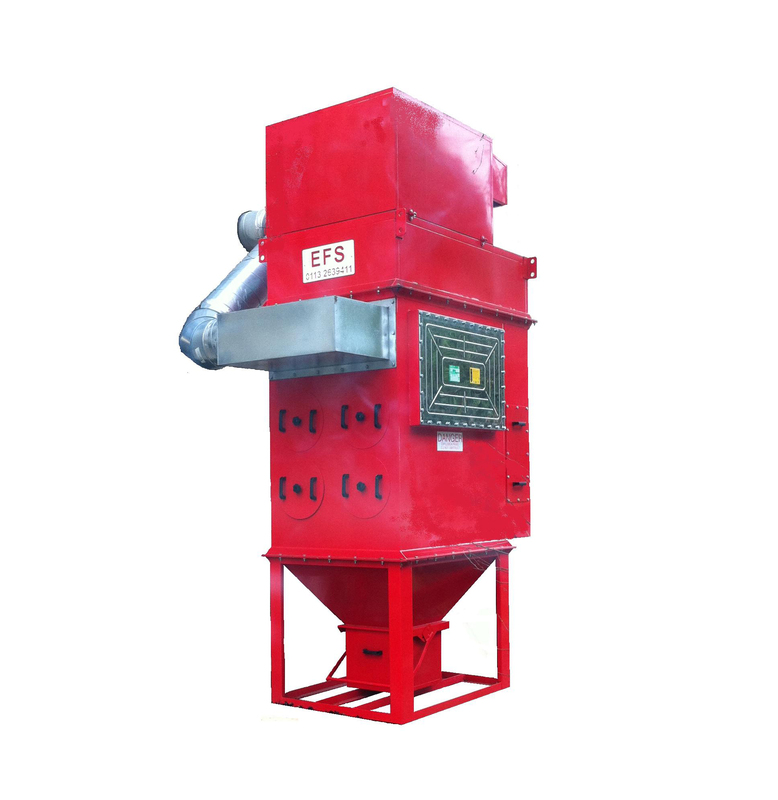 All the EFS range of filter plants have the ability to be fitted with different waste collection/discharge arrangements from quick release bins to bagging off hoppers, rotary valve arrangements to trough hoppers and screw conveyors. All the EFS range of filter plants have the ability to be weatherproofed, to allow for external installation. EFS can also weatherproof existing plant to allow for external relocation. 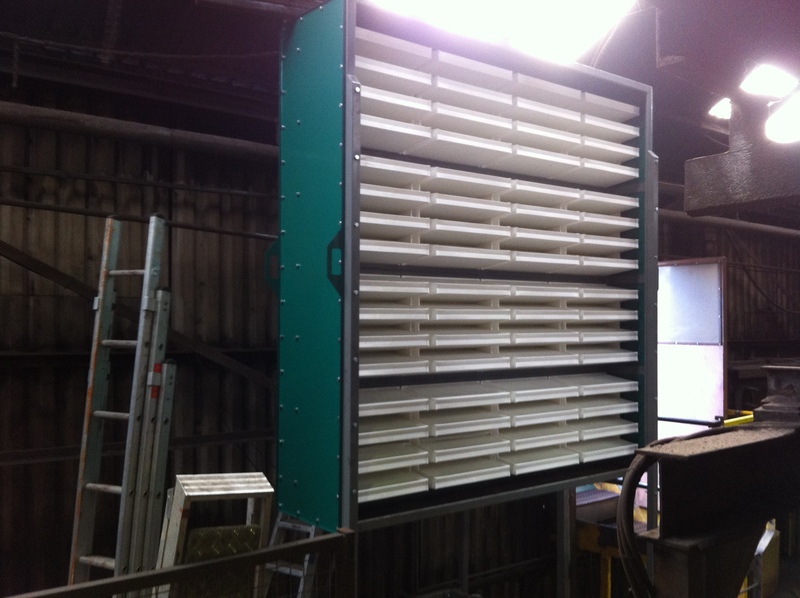 For Toxic dust applications HEPA absolute filters can be fitted to filter out fine particles of dust. Monitoring of the filter media condition can be achieved by simple dial gauge manometers or more advanced digital manometers fitted with alarms to indicate bag failure. To comply with regulations on materials where there is a risk of explosion, correctly proportioned explosion relief panels can be provided as an integral part of the filter unit. Full details are available on request.